Quite a few friends have asked me why I bought an out of production Hero Impulse instead of the recently launched Royal Enfield Himalayan. All of them thought the reason was because I hate Royal Enfield. For the record, I don’t hate Royal Enfield. I just dislike the way they engineer and manufacture their products, that’s all. I seriously considered buying a Himalayan before I bought a brand new Impulse. Yes, you can still buy a brand new Impulse from remote rural Hero dealers who still have stock. I compared both motorcycles and made what I believed to be an informed decision. Let’s talk about the important numbers that really matter and see which motorcycle is more suitable for taking off-road. While you read this, please bear in mind that my purpose of buying a dual sport motorcycle was to primarily ride it off-road. I already have other motorcycles that are better suited for highway only riding. I’ve ridden a few motorcycles off-road ranging from the ultra light and nimble KTM 450 EXC to the big and heavy Triumph Tiger 800 XRx. Believe me when I say that weight is the number that decides whether you are going to have fun with the motorcycle off-road or not. All other numbers are secondary. Every motorcycle can be ridden off-road, no matter how big and heavy it is. But even the most skilled riders are going to find it more cumbersome to ride a heavy motorcycle on a trail than a light one. The whole point of riding a motorcycle off-road is to have fun. If you are going to constantly struggle to stay on top of the motorcycle and deal with its weight, then you are defeating the purpose of riding off-road. There is a very good reason why dual sport motorcycles and dirt bikes are designed to be extremely light and nimble. The kerb weight of the Impulse is 134 kgs, whereas that of the Himalayan is 182 kgs. That’s a whopping 48 kgs more. By no stretch of imagination can I consider the Himalayan to be a light weight motorcycle specifically designed for off-road use. If you add a tank full of petrol you are looking at close to 200 kgs before adding your own weight. Depending on your level of off-roading skill, that could be quite a lot. This is a number that decides how you are going to ride the motorcycle off-road. Are you going to confidently smash into obstacles or gently putter around them. I’ve heard people compare the 21 inch front wheel of the Himalayan with the 19 inch wheel of the Impulse and conclude that the Himalayan has a greater ground clearance. Actually its quite the opposite. The ground clearance of the Himalayan is 220 mm and that of the Impulse is 245 mm. That’s a good 25 cm more. It really doesn’t matter how big the front wheel is. The wheel is going to over the rock anyway. It’s the underbelly that is going to smash into the rock. The fact is the underbelly of the Himalayan sits an inch lower than that of the Impulse. The Impulse is notoriously known for its low power. But the Himalayan doesn’t really shine in the power department either, even though it is 75% more powerful than the Impulse. I’ve spent the past couple of weeks confirming my beliefs about the Impulse. You can cruise on highways very comfortably between 70 to 80 kmph. The max I’ve done is 105 kmph. You can ride simple trails and climb not too steep slopes without a problem. So if you plan on riding trails that aren’t too serious, the Impulse will work for you just as well as a Himalayan. However, if you plan on riding some really gnarly trails with steep inclines then you may find the Impulse lacking. This is the number that sealed the deal for me. I bought a brand new Impulse for Rs. 66,000. A brand new Himalayan costs almost thrice as much. Even if I replace the Impulse’s engine with that of a Karizma, make all the performance mods I possibly can and get it ready for the Raid de Himalaya, I will still end up spending much lesser than a new Himalayan. If you can’t find a dealer to sell you a new Impulse and end up buying a pre-owned one, then you will end up saving even more. Finally, after considering these factors and more, the weight and cost of the Impulse made it a no brainer for me. It made absolutely no sense for me to buy a Himalayan when my needs could be met by a motorcycle at a third of the cost and which weighed 48 kgs lesser. That’s 48 kgs lesser to lift up when I drop the bike on a trail, which is going to be a common occurrence given the kind of trails I ride. To put it simply, the Impulse is a dual sport motorcycle and the Himalayan is an entry level adventure motorcycle. Dual sport motorcycles are designed to be light and nimble and used primarily off the tarmac. On the other hand, adventure motorcycles are designed to be heavier and more powerful because they need to carry luggage. They are primarily ridden on the highway and have a decent amount of off-road capability. 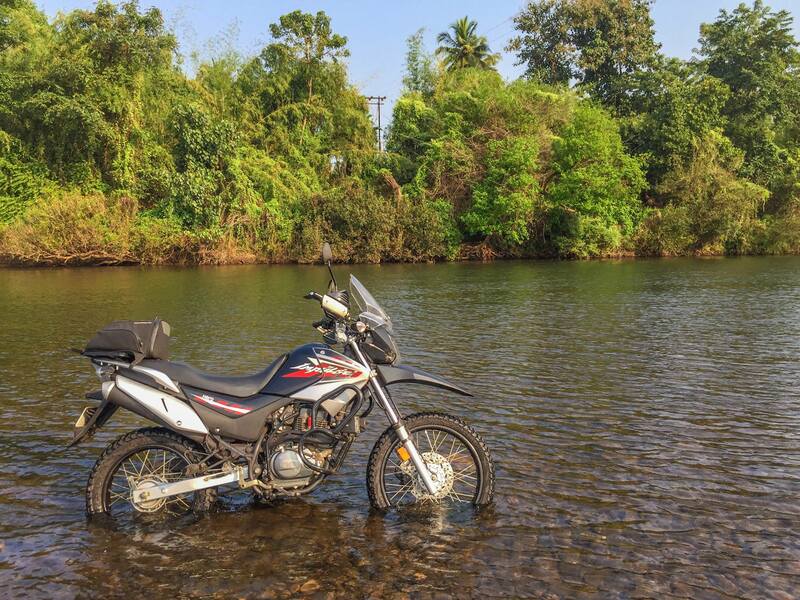 So depending on exactly what you want to do with the motorcycle, you need to decide whether you want a dual sport or an adventure motorcycle. If you already have a motorcycle for long distance highway trips and want something to ride just trails, then you could keep the motorcycle you have and buy an Impulse. You will have much more fun with an Impulse on a trail than with a Himalayan. Those 48 kgs are going to make a huge difference in the way you ride. But if you want just one motorcycle for highway rides as well as trails then you are better off buying a Himalayan. I already have a Triumph Tiger 800 XRx, a proper adventure motorcycle. I needed a lightweight dual sport motorcycle to ride to a trail, ride the trail and ride back home. The Himalayan was an overkill for that, both in terms of weight as well as cost. Hence the Impulse.